Rockman Corner: Udon Announces Mega Man Mastermix – Hitsohi Ariga Comics in Color! Udon Announces Mega Man Mastermix – Hitsohi Ariga Comics in Color! Say hello to Mega Man Mastermix – it's Mega Mega Megamix remastered in color! Officially announced at Comic-Con, Udon Entertainment will be publishing the series an an ongoing quarterly comic starting January 2018. Josh Perez will be the colorist. Issue #1 debuts with 80-pages. I'm sure you have lots of questions right now. But for the moment, this is all that can be shared. In the meantime, let me say I think you're really going to like the look of this. I have been waiting a long time to share this project. I got to see a bit of Mastermix a little over a year ago and, man, the colors look great. Josh Perez has done a fine job complimenting Ariga's style. Look forward to it! Mega Mix in Color? Ok, I'll bite. When GN's are released, anyway. Yet more MM stuff to buy, I'm happy but my wallet is crying. Finally. An opportunity for me to buy comics again. Even better, I never read megamix in the original Manga format only gigamix so this is an instabuy for me. Man I miss megaman comics. I wish Udon can pick up the rights to megaman so we can see new original takes on the blue bomber's legacy. I'll miss Bates and Spaz tho, no doubt there will be no other artists at Udon that can match how close those two came to representing Mega Man in the most authentic way possible. So that is the secret project Ariga is working on? I remember reading a tweet two years+ ago (?) where he says that there is something in the works. Back then I hoped he was working on a MM9/MM10 manga, but I've not expected a colered version of his works. Anyway I love the Megaman mangas, so Im fine with a colored version. If you don't expect Ariga just re-re-editing his old works, then you don't know Ariga. I mean, Ariga isn't the one actually colouring this. Josh Perez is. I thought his hidden project was the Mega Man Tribute book? I thought Ariga's hidden work was the Mega Man Tribute book? He's the one that put that together. Personally I don't find it interesting no matter how good the color looks. 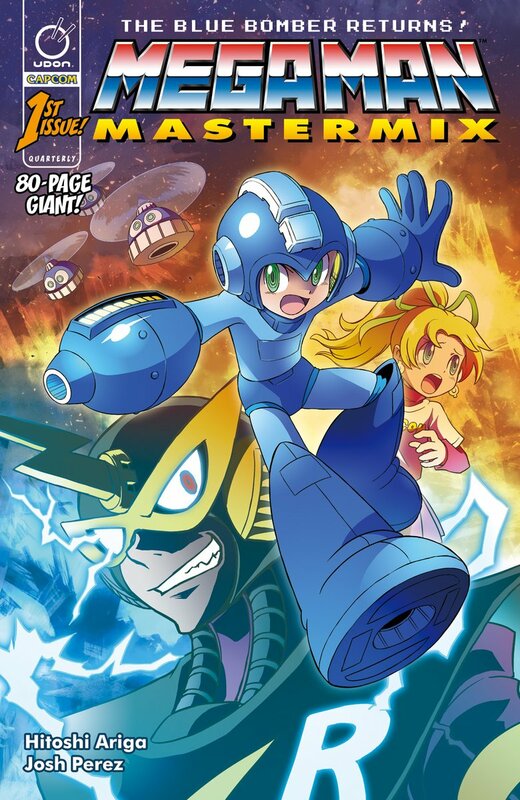 I rather have new stuff translated than this, like the X manga or Rockman 6 & 7 (I know the art is not as appealing as Ariga's art) or even a reprint of the EXE manga if legally is possible. I know what you mean. I'd give anything for the entire Mega Man X manga line to get an official translation, even that weird X5 one made exclusively for China. Great, so now they're porting comics too. Not a fan of Ariga but even if I was I'd be tired of the constant re-releases of his very old work all day. Man when I really think about it Archie really was the best Mega Man had comic-wise. If only it was popular and didn't crossover with Sonic essentially promoting Sonic and other franchises more so than cross promoting itself. Mega Man always gets the raw end of every stick, it's a damn shame and unfortunate. Actually FYI, many Ariga fans are very supportive for his re-releases. The only why you believe Mega Man "always gets the raw end of every stick" is because you're biased against someone's work who actually reinvents whatever story Mega Man had. How many western localisations have there really been for Megamix/Gigamix though? As far as I know there is just the 2010-2011 releases. Two runs is fine in my book, especially considering these will be in color and larger print, which are significant upgrades IMO. isnt the original gigamix like 600 pages long?